Our visa service is available only for the residents of following states: Alabama, Arkansas, Connecticut, Florida, Georgia, Louisiana, Maine, Massachusetts, Mississippi, New Hampshire, New Jersey, New York, Ohio, Oklahoma, Pennsylvania, Rhode Island, Texas and Vermont. Sorry if your state is not on this list. Return Shipping by FedEx 3-Day Service Included. Estimated time: 3 weeks after we receive your application to get your visa back. Your actual passport. It must be valid for at least 1 year for 10-year visa or 6 months for short period visa. It must have at least 3 blank pages titled "Visas" at the top. 10-Year Multiple Entry - On the Visa Application Form Item 2.2, please check the box "Other" and specify "Multiple entries for 10 Years." You can apply only after your current visa has expired or will expire before your upcoming trip in a month. One 2"x2" color photo affixed on the visa application form. 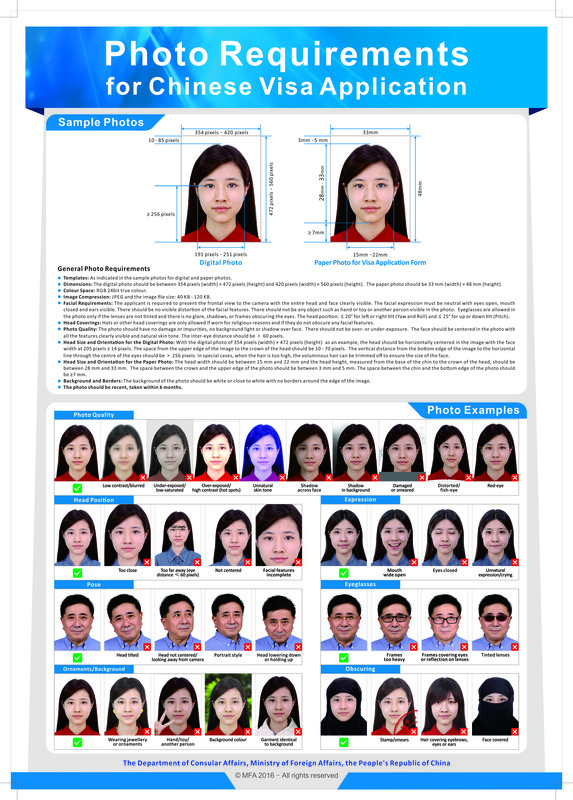 The consulate accepts only passport photo in white background with both ears visible. No glasses/jewelry. No self-taken photos. No photo editing. See examples. Hotel reservations covering your full length of stay. Hotel confirmation must show each visa applicant's name. A personal invitation letter can be a substitute of this requirement. See below for details. If previous China visa was not on your current passport, a copy of your previous Chinese Visa page and your previous passport's main page is also needed. Other required documents as specified. Click for Tourist, Family Visit or Business or other types of visa (work, study, transit). Born in China - If you were born in China and there is no previous Chinese visa on your current passport, you are required to submit your actual previous Chinese passport. Photocopies not allowed. If your last foreign passport has a previous Chinese visa, you need to send a photocopy of the old foreign passport's main page and Chinese visa page instead of your previous Chinese passport. Children under 18 - If you apply for a visa for any of your children under 18, then you must include photocopies of your child's birth certificate, passport and US permanent resident card (if not a US Citizen) of your child's both parents. Please do not send your original documents. If your child was born before any of the two parents becoming US Permanent Resident, then you must apply the Chinese Citizen Travel Document instead of the Chinese Visa for your child. Non-US Citizen - Must be US permanent resident or H-1 or L-1 visa holder with at least 6 months of validity. Your permanent resident card copy or I-94 is required. Please do not send your original green card. For other visa holders, you are required to obtain your China visa in the country of your citizenship. Citizens of India and Pakistan - Unfortunately, we are unable to process your application. You must apply with the consulate in person.